Here are some snazzy birthday facts about 23rd of November 1941 that no one tells you about. Don’t wait a minute longer and jump in using the content links below. Average read time of 10 minutes. Enjoy! What day was my birthday Nov 23, 1941? November 23, 1941 was a Sunday and it was the 327th day of the year 1941. It was the 47th Sunday of that year. The next time you can reuse your old 1941 calendar will be in 2025. Both calendars will be exactly the same! This is assuming you are not interested in the dates for Easter and other irregular holidays that are based on a lunisolar calendar. What day is November 23 this year? There are 218 days left before your next birthday. You will be 78 years old when that day comes. There have been 28,271 days from the day you were born up to today. If you’ve been sleeping 8 hours daily since birth, then you have slept a total of 9,424 days or 25.80 years. You spent 33% of your life sleeping. Since night and day always follow each other, there were precisely 957 full moons after you were born up to this day. How many of them did you see? The next full moon that you can see will be on April 19 at 11:14:00 GMT – Friday. Fun stat: Your first one billion seconds (1,000,000,000) happened sometime on August 1, 1973. If a dog named Raplhie - a Havanese breed, was born on the same date as you then it will be 328 dog years old today. A dog’s first human year is equal to 15 dog years. Dogs age differently depending on breed and size. When you reach the age of 6 Raplhie will be 40 dog years old. From that point forward a small-sized dog like Raplhie will age 4 dog years for every human year. View the complete list of November 23 celebrity birthdays. Who are the famous November 23 birthdays? Here’s a short list of famous people in history who were born on Nov 23. View the complete list of November 23 famous birthdays. What happened on my birthday – Nov 23rd? Thespis of Icaria becomes the first recorded actor to portray a character onstage. Conquest of Seville by Christian troops under King Ferdinand III of Castile. Heber J. Grant succeeds Joseph F. Smith as the seventh president of The Church of Jesus Christ of Latter-day Saints. Life magazine is reborn as a photo magazine and enjoys instant success. World War II: The Deutsche Opernhaus on Bismarckstraße in the Berlin neighborhood of Charlottenburg is destroyed. It will eventually be rebuilt in 1961 and be called the Deutsche Oper Berlin. French President Charles de Gaulle declares in a speech in Strasbourg his vision for “Europe, from the Atlantic to the Urals”. Apneist Jacques Mayol is the first man to reach a depth of 100 m undersea without breathing equipment. A series of bombings kills at least 215 people and injures 257 others in Sadr City, making it the second deadliest sectarian attack since the beginning of the Iraq War in 2003. Bombardment of Yeonpyeong: North Korean artillery attack kills two civilians and two marines on Yeonpyeong Island, South Korea. View the complete list of November 23 historical events. What does my birthday November 23, 1941 mean? 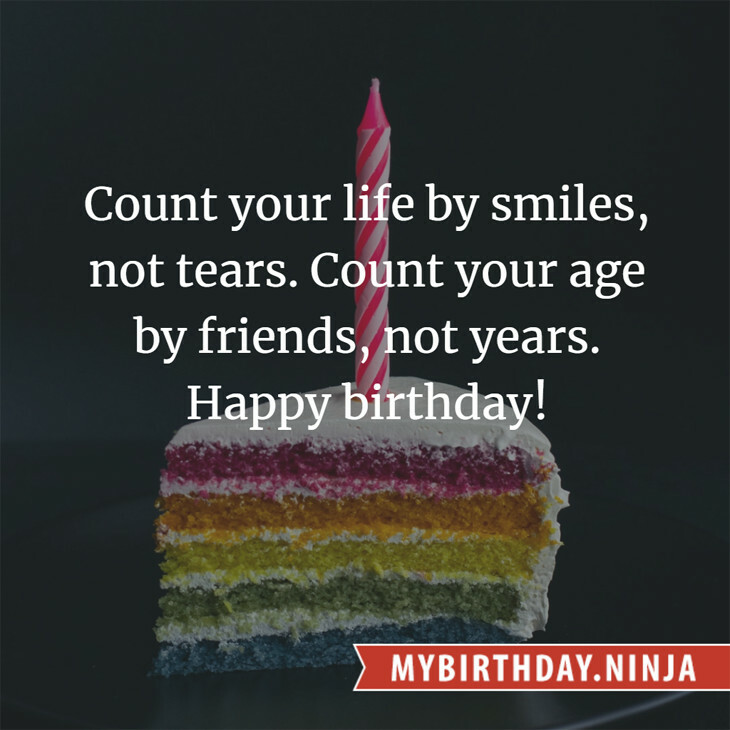 Your birthday numbers 11, 23, and 1941 reveal that your Life Path number is 22. It is a master number that represents practical idealism and material mastery. You were born under the most powerful and potentially the most successful of all Life Path numbers. The following celebrities also have the same life path number: Tupac Shakur, Mike Vernon, Liam Lynch, Miriam McDonald, Violeta Isfel, Eri Kitamura, Joel McHale, Jocelyn Brando, Georgie Fame, Lauren Taylor. 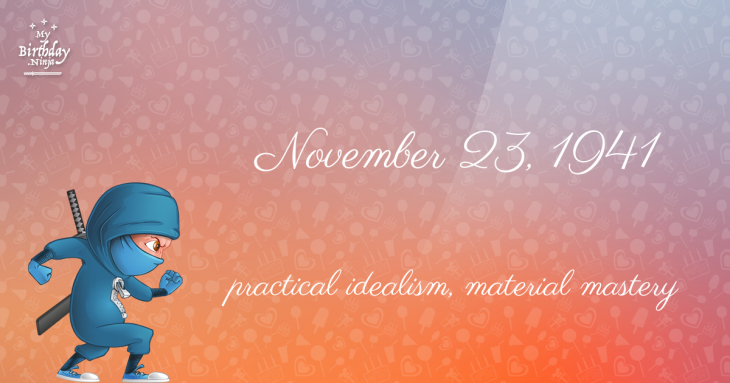 What is the birthday horoscope for Nov 23, 1941? The Western zodiac or sun sign of a person born on November 23 is Sagittarius ♐ (The Archer) – a mutable sign with Fire as Western element. The ruling planet is Jupiter – the planet of luck and expansion. According to the ancient art of Chinese astrology (or Eastern zodiac), Snake is the mythical animal and Metal is the Eastern element of a person born on November 23, 1941. What is the birthstone for November 23? Fun fact: The birth flower for 23rd November 1941 is Chrysanthemum for loveliness. What is the Love Match for Nov 23, 1941? When it comes to love and relationship, you are most compatible with a person born on July 25, 1953. You have a Love Match compatibility score of +136. Imagine being in love with your soul mate. On the negative side, you are most incompatible with a person born on February 20, 1948. Your incompatibility score is -140. You’ll be like a cat and a dog on a love-hate relationship. Arf-arf, I want to bite you. Meow-meow, stay away from me! What is a good birthday trivia for November 23? I do not know how you feel about this, but you were a male ♂ in your last earthly incarnation. You were born somewhere around the territory of Southern New Zealand approximately on 775. Your profession was writer, dramatist, organizer of rituals. What is the popular baby name on 23 Nov 1941? What’s your bizarre Florida Man story? The #FloridaManChallenge is breaking the Internet and social media. Some crazy men, women, or creatures from the Sunshine State are making headlines every day of the year including your birthday. Try this fun exercise. Pick your search engine of choice and type in “florida man November 23” and see what kind of wild news headline you will get. This viral craze started in 2013 and gets resurrected now and then. The latest was from Tumblr and found its way to Twitter. As they say, the rest is history. Here’s a quick list of all the fun birthday facts about November 23, 1941. Celebrities, famous birthdays, historical events, and past life were excluded. Try another birth date of someone you know or try the birthday of these celebrities: October 26, 1961 – Dylan McDermott, American actor; January 19, 1926 – Fritz Weaver, American actor; May 3, 1989 – Nadia Forde, Irish model, singer and actress.